We’d love your help. Let us know what’s wrong with this preview of 100 Days to Brave by Annie F. Downs. Annie F. Downs felt her challenges were too difficult, too scary, too much. Then she decided to stop allowing fear to hold her back. It wasn't easy or simple. But it was good. You were always meant to be brave. To ask other readers questions about 100 Days to Brave, please sign up. I listen to Annie's podcast. The book this devotional is based off of, Let's All Be Brave, is really important to me. 100 days, unfortunately, was just too long for this devotional. While there were meaningful, challenging days, there were also a lot of filler, fluff days. Also, I lost steam personally, which isn't Annie's fault, but I feel having less of the fluffy, filler days would have helped me maintain momentum. I’ve been reading this for the past 100ish days. I’m not sure if I’m braver than when I started, but Annie Downs has definitely given me a lot to think about! It took me longer than 100 days but I finally finished. It gave me alot to think on. Downs is encouraging and creative. She is easy to read and easy to relate to. "Earth (the book)" by The Daily Show with Jon Stewart defined a self-help book as a book written by an author "who self-helped themselves to sad people's money". Jesus Christ, I work at a store that plays an ad for this book every 10-15 minutes, and it is the most obnoxious, psuedo-intellectual, condescending, placating tripe that I've ever had too suffer through...multiple times a day. "What does it mean to be brave? Is it the way you speak or stand? Or does it have to do with small acts of lea "Earth (the book)" by The Daily Show with Jon Stewart defined a self-help book as a book written by an author "who self-helped themselves to sad people's money". A great devotional for adults or teens, 100 Days to Brave is a quick and easy read that will help motivate you to take action on living a more courageous life (in manageable, actionable steps). This would make a wonderful gift for graduates. This was an amazing journey and devotional that touched my life in so many ways. It has shown me that even when I do not feel brave, I am being courageous in little ways with each decision that I make. A wonderful read! It was so exciting to make it to Day 100! Many of the "days" had really good thoughts in them--they were thought-provoking without being burdensome or trivial. One of my favorite things about this book was its size--it fits well in the hand and the pages are smooth. The special thing about this book is that it was given to me out of the blue by a friend who said, "Do you want to do this with me?" And I said, "Yes!" and that was the first step to being brave. Love Love Love. My first Annie F. Downs book and I got to Day 5 before adding all others to my GoodReads To Be Read list. I love how relatable, and funny and practical the advice and stories are. I love hearing her voice sound like my own telling me that it won't all be beautiful-but be brave anyway. Loved it. It felt so weird to not read this today! I ended up absolutely adoring this. Annie's stories were so endearing and illustrated each point perfectly. I think that we kind of put bravery in this box of what it's supposed to be, and we forget that it can be something as simple as deciding to text a friend, or exercise, or ask God a question. There are so many ways we can be brave; we just have to be willing and open. I can't wait to read more of Annie's books in the future. This devotional will help you walk through being a more godly, braver version of you. It addresses all the areas of wellness and what makes you you. A devotional a little different from the average. I enjoyed this, even though I read a few a day. Authentic as if sitting and chatting with your best friend. Love her heart for people and God. This book was exactly what I needed for this season! She encourages all of us to be brave. To see the small acts that are brave, that so many of us over look. Annie is such a great story teller and a friend, even though we’ve never met! I highly encourage reading this book!! It took me a little longer than 100 days to read this devotional. :) I loved it and it has been the book that I have given as a gift multiple times this year. The main issue with this book was that it was full of issues. The author just keeps on talking about her own problems in the book at times. The number of times she talks about how she is single and what her therapists say etc etc. There isn't God in any of those those are human problem and can be solved easily of she stops focusing on those this much. You can't just make God responsible for all of your problems. Somethings are because of your own doings. Acceptance is the first step. And then ta The main issue with this book was that it was full of issues. The author just keeps on talking about her own problems in the book at times. The number of times she talks about how she is single and what her therapists say etc etc. There isn't God in any of those those are human problem and can be solved easily of she stops focusing on those this much. This book was a solid meh. There was nothing dislikeable about it, but there was nothing particularly profound.One of those books you wouldn't recommend, and you wouldn't stop someone from reading. Perhaps this is more suited to a teenage audience. Downs is a friendly light-hearted read. The thing is her messages were obvious and the daily challenges were underwhelming. But maybe I'm too old for this book. Pops of confetti everywhere for this book! I loved this devotional dearly. It has perfect timing coming into my life! I would love for Annie to do a 365 day devotional. Go out into the world and be brave! I wouldn’t put my name and brave in the same sentence. I’m terrified of everything. Anyone in that boat knows how exhausting that can be. Maybe that’s what drew me to 100 Days to Brave — a desperate desire for change. Annie F. Downs doesn’t provide a formula or set of rules that suddenly banishes fear and makes us brave. Instead, she spends 100 days reminding us who we are in God and who we are made to be. Equipped with this reinforcement, we can then go out and act bravely in spite of our fear. W I wouldn’t put my name and brave in the same sentence. I’m terrified of everything. Anyone in that boat knows how exhausting that can be. Maybe that’s what drew me to 100 Days to Brave — a desperate desire for change. Without a doubt, 100 Days to Brave has become my favorite devotional to date. Every entry begins with a Bible verse, followed by the lesson, and ends with a mini-assignment or call-to-action. Whether starting or ending the day with it, the bite-sized entries ensure total absorption without overwhelming. I still have a long way to go before I can say I’m brave, but I’m making the journey one step at a time. Downs’ devotional helps me to be more deliberate in this walk even as I go about my daily life and routines. I especially love her Christ-filled and Scripture-centered approach as she encourages readers to remain grounded in God’s Word. The author’s honest and humorous voice as she shares personal anecdotes makes her relatable. Her keen insight at times left me to wonder if she possesses a secret peephole into my life to know exactly what I need (not want!) to hear. This was unfortunately the worst devotional / daily reading that I've ever picked up. I couldn't even finish it. Finally at about halfway through Part 2...it occurred to me that I'm not required to sit through any more of this nonsense, so I got rid of it and will not read or listen to this author again. Not for me. The problem was how superficial and Christian-fluffy-talk it was. This book is not written for adults, and definitely not for women with families, kids, careers, etc. This one seemed This was unfortunately the worst devotional / daily reading that I've ever picked up. I couldn't even finish it. Finally at about halfway through Part 2...it occurred to me that I'm not required to sit through any more of this nonsense, so I got rid of it and will not read or listen to this author again. Not for me. The problem was how superficial and Christian-fluffy-talk it was. This book is not written for adults, and definitely not for women with families, kids, careers, etc. This one seemed to be geared toward girls from maybe 17-23 who don't know what their next step is or are nervous about life after graduation or something. If this book is about being brave and having courage, that message was totally lost on me. Not once did I feel empowered or compelled to bravery by any of it. It seemed much more like regurgitated "finding my purpose" ramblings. The language she uses, her little 'be brave' action tips, the painfully simplistic anecdotes she shares, and the overall churchy white-picket-fence, Jesus-loves-me, southern girl, bible belt vibe was all kind of stomach churning. Most days after reading, I would find myself annoyed that I spent time and money on this silliness. I've read Annie Downs' book Let's All Be Brave and gave it a pretty scathing review. I had forgotten about that when I ordered her devotional 100 Days to Brave which I'm glad of because I would have missed out on a great little piece of encouragement. This devotional is 100 short devotions that lead us to unlocking our most courageous self. The dictionary lists the definition of courage as " the ability to do something that frightens one" and "strength in the face of pain or grief" which I found I've read Annie Downs' book Let's All Be Brave and gave it a pretty scathing review. I had forgotten about that when I ordered her devotional 100 Days to Brave which I'm glad of because I would have missed out on a great little piece of encouragement. This devotional is 100 short devotions that lead us to unlocking our most courageous self. The dictionary lists the definition of courage as " the ability to do something that frightens one" and "strength in the face of pain or grief" which I found interesting. Life takes courage, and courage can be found in God. This book is about trusting in Him, in His plan for us, and in truth. Whether we need courage to change jobs, stand up for ourselves or others, deal with an illness, or make a drastic life change we can find that courage when we look to God. This devotional helps us stop believing lies, stand our ground when the world wants us to conform, be brave for others, and so much more. The reason I found the definition of courage interesting is because sometimes I've been amazed by my own courage, especially through pain and grief. I know that it isn't from myself, but rather a blessing from God when I truly needed it. Other times my courage wanes and I need encouragement to spark it. My husband and I are reading this devotional together daily and are finding it helpful and uplifting. Reading this book by Annie F. Downs reminded me of visiting with my younger sister, the millennial (I’m a Gen X gal). Her style is casual, funny, and hip, and I found it refreshing, especially on this topic. She is real and unpretentious and freely shares stories from her own life. "This morning when I did not like the look of the jeans I put on, I told myself so. Old Annie would have continued a barrage of ugly remarks about my looks, but instead, I looked in the mir Reading this book by Annie F. Downs reminded me of visiting with my younger sister, the millennial (I’m a Gen X gal). Her style is casual, funny, and hip, and I found it refreshing, especially on this topic. She is real and unpretentious and freely shares stories from her own life. "This morning when I did not like the look of the jeans I put on, I told myself so. Old Annie would have continued a barrage of ugly remarks about my looks, but instead, I looked in the mirror and said, 'Hey, put on a different pair. No biggie.' And I shook it off and changed…If you are going to be the person who does the brave things God is calling you to do, speaking life and developing beautiful things in others with your words, it begins with doing that for yourself." This book would make a good gift for a high school graduate, a college graduate, a new mom, or a woman changing careers. It’s geared for millennial readers, but I also enjoyed it myself as a light, entertaining read with nuggets of truth. Doing the read-along with Annie the last 100 days was so much fun. I hope she does them frequently for others to experience. I liked this book, but I probably wouldn't recommend it. While Annie's life stories do fit with the prompts to become more brave, many repeat and some really stretch to meet the point. A lot of the challenges aren't really challenges that help you become more brave either. It is also very faith based. While it helped strengthen my understanding of my Christian faith (which Doing the read-along with Annie the last 100 days was so much fun. I hope she does them frequently for others to experience. I liked this book, but I probably wouldn't recommend it. While Annie's life stories do fit with the prompts to become more brave, many repeat and some really stretch to meet the point. A lot of the challenges aren't really challenges that help you become more brave either. It is also very faith based. While it helped strengthen my understanding of my Christian faith (which I already wanted to do post-Israel trip), I know that's not everyone's cup of tea, and I struggled with the idea I must have a higher power to be brave. What I've discovered about myself is I'm not a fan of longer devotionals. I prefer the 30 or 40-day kind that I can finish without falling behind. I may not have read this every day for 100 days, but I did finish it, and I enjoyed it. Some of the stories I'd heard before in Annie's book "Let's all be Brave", but there is new content too. I wish Annie was at church with me in real-life because I feel like there's so much I could learn from her. My biggest takeaway from this book is the day when sh What I've discovered about myself is I'm not a fan of longer devotionals. I prefer the 30 or 40-day kind that I can finish without falling behind. I may not have read this every day for 100 days, but I did finish it, and I enjoyed it. Some of the stories I'd heard before in Annie's book "Let's all be Brave", but there is new content too. This book will change your life. 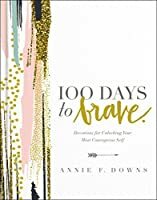 “100 Days to be Brave” is in the format of a devotional. This book challenges the reader on what it means to live a life with bravery, courage and willing to face road blocks in life. At the end of each page, there is a challenge. I have been encouraged to journal my journey with God through moments of bravery and moments where I haven’t felt courageous with each of these challenges by Annie. This book will help you to dare and dream bigger, while stepping out of This book will change your life. 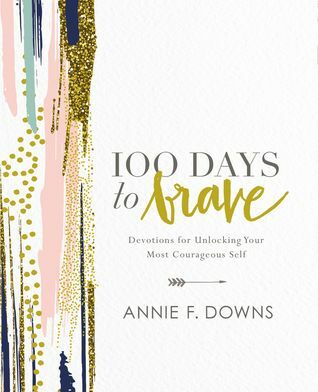 “100 Days to be Brave” is in the format of a devotional. This book challenges the reader on what it means to live a life with bravery, courage and willing to face road blocks in life. At the end of each page, there is a challenge. I have been encouraged to journal my journey with God through moments of bravery and moments where I haven’t felt courageous with each of these challenges by Annie. This book will help you to dare and dream bigger, while stepping out of your comfort zone. Get ready to take on a journey with God that will help you step out and face fears in your life.